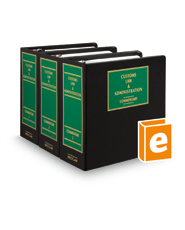 This multivolume set provides authoritative analysis of the laws and regulations relating to valuation, classification of goods, rules of origin, antidumping and countervailing duties, unfair trade practices, penalties, and other trade-related topics. It also contains invaluable case summaries, expert commentary, and helpful primary source tools and references. Terminology and procedure are clearly explained with specific discussion and reference to Titles 19 of CFR and the U.S. Code, and caselaw decided by the U.S. Court of International Trade and other federal and state courts.